Wha?, originally uploaded by Nigel Stewart. I think it took me about two hours to get through it all on Monday afternoon. 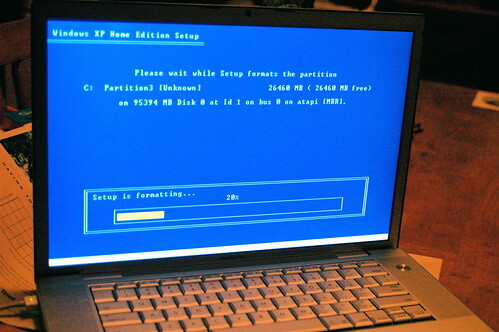 That night I just booted into XP's start up and made some system preference changes. Fell asleep dreaming of the default Windows Desktop Landscape of Eternal Goodness. The first thing I did on Tuesday morning was load up Firefox to see what the net connection was like. Already I could notice that the MacBook Pro I have (2.0 Core Duo 1GB RAM OS 10.4.6) was much snappier than the four or five year old hp pavilion I've had as my gaming machine (Athlon AMD 1600 512MB RAM XP Home). Loaded up my bookmarks into Firefox and in the afternoon I wound up buying The Elder Scrolls IV: Oblivion based on all the rave reviews and sales figures. Sorry. I loaded up the game and played at 1400 x 900 or so and it was nice but I thought Half Life 2 was better looking. Worked on Wednesday (day playing on Pepper Dennis @ Fox) and on Thursday I loaded up Steam. Steam games are incredible on the Mac. Quick and crisp. Holy Crap is the MacBook Pro fast. I can now retire my hp and possibly my PowerMac G5 Dual 2.0. It's faster than both. It runs in dual screen mode or lid closed. I ran Counterstrike 1.6 for 2.5 hours at 1920 x 1200 at 75 fps. I'm getting better scores. My pings are higher. Windows is smooth and creamy but I will only use it for gaming. All the sweet mac software is just a boot or KVM switch away. Thank you Apple and all the developers out there. The world is a better place. This page contains a single entry by Nigel published on April 15, 2006 12:55 AM. japan at joe's was the previous entry in this blog.